Brig. 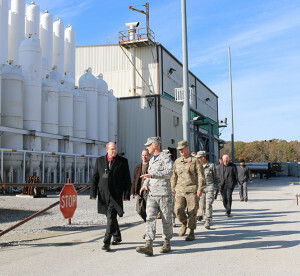 Gen. Christopher Azzano, commander of the Air Force Test Center, right, speaks with Lance Baxter, director of the Arnold Engineering Development Complex Hypersonic Systems Combined Test Force, during a Nov. 16 tour of the Aerodynamic and Propulsion Test Unit. 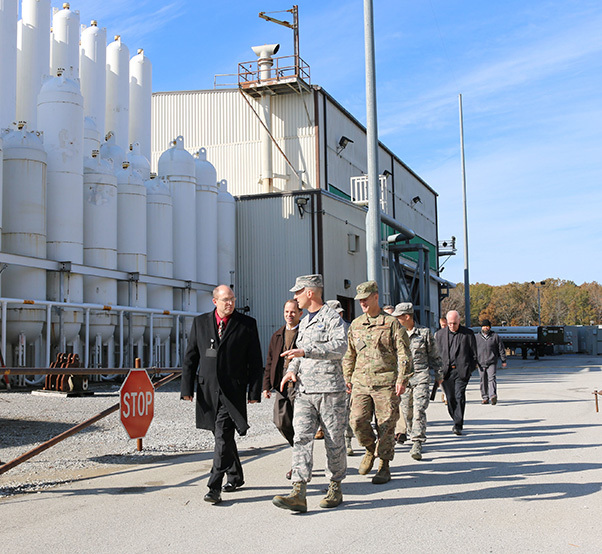 Azzano and other AFTC leadership visited Arnold Air Force Base, Tennessee, in mid-November to take part in the 2018 AFTC Strategic Offsite, Azzano’s first offsite since assuming the role of AFTC commander in August. The AFTC is headquartered at Edwards Air Force Base, Calif. The organization has oversight of various testing missions across the nation — the 96th Test Wing, Eglin Air Force Base, Fla., Arnold Engineering Development Complex, Arnold Air Force Base, Tenn., and the 412th Test Wing, also at Edwards. The creativity and flexibility of the AFTC is also a principle that Azzano recognizes and aims to continue. Azzano cited an example of the AFTC’s flexibility during the Air Force’s Light Attack Experiment. The experiment took place at Holloman Air Force Base, N.M., under purview of AEDC. The Light Attack Experiment evaluated commercial “off-the-shelf” platforms to explore cost-effective options to provide relief for 4th and 5th generation aircraft and also bolster international interoperability. The Air Force Research Laboratory was tasked with the experiment, and they turned to the AFTC for support. Lastly, Azzano said that a “relentless focus” on the warfighter as an enduring principle is critical to the AFTC mission. The key to the AFTC’s successes in the past and for the future is applying those enduring principles, to emerging domains, and trying to think ahead of adversaries in a rapidly evolving environment, Azzano said. And part of that lies in harvesting innovative ideas and harnessing a talented and passionate workforce. Azzano said that the challenge lies in effective communication with the AFTC’s customers with the key being constant engagement. That workforce is vital to the success of the AFTC and the Air Force as whole, Ditore said. Ditore, who joined Azzano as his command chief in November 2018, was personally asked by the general himself because of his previous assignment as the command chief of the 18th Wing at Kadena Air Base in Okinawa, Japan. Ditore said he is eager to meet the Airmen and civilians across the AFTC and get to work. “I want them to understand how their actions today is enabling the bigger picture; somebody turning a wrench out on the flight line is enabling a test tomorrow, which is enabling a capability six months from now, which might enable a new architecture or maybe trigger a strategic level ‘sea-change.’ That is something that is often lost when you are caught up in the day-to-day activity. We are very high op-tempo, so I just want people to take a step back and look and listen and think, and realize that we are doing something important,” Ditore added. Azzano and Ditore both plan to engage both leadership and the workforce so that they can better assess the organization’s needs, while also reminding them of how important their work is. And also to harvest possible innovative new ideas. Technology is constantly evolving, and for an organization like the AFTC, being ahead of the nation’s adversaries is challenge that the command is ready to tackle. The AFTC is involved in emerging technologies such as hypersonic systems, cyberwarfare systems and space. Azzano explained the challenges of being ahead of current technological trends. New technologies lead new systems and capabilities by several years, up to eight or even 10 years, Azzano said. One of the current weapon technological trends is hypersonic systems, and the AFTC is poised at leading the nation’s test and evaluation efforts in this emerging field. “We’ve seen a dramatic increase in the focus on hypersonic development among many of our adversaries and within the last few years, it’s become one of the key objectives of our own defense effort,” Azzano said. Hypersonics is a very harsh, unforgiving and technically challenging realm, going from a periodic program such as the X-51 Waverider research aircraft to current full-scale attempts. The AFTC is already working to develop technologies to develop weapons programs and other future systems. The planned creation of a new branch of the military responsible for space operations means that the AFTC should be an active participant in the testing and development of space systems, Azzano said. Azzano explained that in terms of military operations and development, the space domain has much room to evolve and the AFTC will play an important role in helping the nation’s space force achieve space superiority and mission assurance in space. The AFTC command team believes the way forward for a successful future is ingrained in its enduring principles and also on its people. The AFTC’s Airmen and civilians understand how critical they are to the nation’s security, Ditore said. For Azzano, the potential for the future is what helps drive him forward.